Today’s episode deals with Section 132 of the D&C. We talk about the introduction of polygamy, the angel with the drawn sword, and Joseph’s adherence with the revelation. While Critics accuse Joseph Smith of creating section 132 to fulfill his sexual needs and while apologists proclaim the revelation is from God and that criticism should cease, I argue there is indeed a third option. An option that is much more nuanced. We take time and use scriptural sources as well as the quotes of leaders to show there is possibly room and precedent to set off to the side section 132 while still holding up Joseph as the prophet of the restoration. When we add up nuanced views of Scripture, Prophets, and ministering angels, is there room to both doubt section 132 while still leading with faith. Bill, just finished the Handshakes and Drawn Swords podcast, enjoyed it very much, made me really re-think D&C 132. But, isn’t it true if a Prophet is not proclaiming the will of the Lord, he will be removed from his position? Well, I guess getting martyred is being removed from his position BUT, you’d think the next Prophet(Brigham Young) would be lead to CORRECT what was wrong instead of multiply it several times over and make it worse than ever. I have always felt a bad feeling when I read section 132, it feels bad in my heart. We have 12 apostles who must agree on the validity of doctrine before it is cannonized, evidently they all were duped by satan also. How and why does God, who is not a God of confusion allow such confusion to be cannonized and put into scripture as doctrine for all these years and it hasn’t been corrected yet? Blacks and the Priesthood wasn’t put in the scriptures but was corrected finally. I really have trouble with section 132 still being in our scriptures, our doctrine, even though Pres. Hinkley told the world on national TV that it is NOT doctrinal. Looks like they would have taken it out right after Pres. Hinkley spoke it, doesn’t it? I do like your analogy of dark angles and how many times this has happened throughout time to prophets. Do you ever think the Church will finally FIX this error and discard it from the scriptures? I know I would personally respect them so much more and so would the rest of all the sisters who suffer so much from this false doctrine. I cannot imagine the good it would do and the heavy weights it would lift off or our hearts. What do you think? after the resurrection. I have such a hard time with this…these are not statements made by Prophets when they “weren’t speaking as a Prophet but as a man”. They were clearly taught as church doctrine and we were told that the Lord will not let Prophets lead us astray….but they did, they were wrong, they did lead us astray. I’m totally confused. Why would we need a Prophet to be the Lord’s mouthpiece and speak God’s will if they get such important doctrines wrong? Even Brigham Young said the Blacks wouldn’t receive the priesthood until the ushering of the millennium. Times change and bigotry dies with whatever the social norm is of the day. Everyone’s thought processes are changed it seems with time and ones ability to critically think things through. My whole worry is that we have 80 & 90 year old men making decisions from their own frame of reference. I am concerned with all the bigotry still within church members today. It seems to be demographically connected; the educationone one has achieved also seems to cause the Brethren to call those of us with half a mind into question. It’s like they’re looking to search and destroy anyone with a legitimate question. why do you think polygamy is wrong? the whole point of this podcast was that ‘we never know what is truly doctrine’. the drawn sword doctrine itself could be false doctrine. interesting that he chooses the shaking hands to be the true doctrine but not polygamy. let us not be ashamed of our past just because it makes us uncomfortable. there is much more to my uncomfortableness with 132 than polygamy. Polygamy itself doesn’t bother me. It is how it was practiced and how men used it to diminish women. I know there are a lot of people out there that love the D & C, but this has been the hardest set of scripture for me to embrace. Section 132 especially. My faith has been tried to its limits over this. How could they possibly de canonize it and still call Joseph Smith a prophet of God, let alone preach that the church is the only true church on the earth today. I remember going through the church history bldg when it was first opened and saw no reference to polygamy. This really concerned me. I am so thankful I have a testimony of our Heavenly Father and of His Atoning sacrifice, or I would have left years ago and never looked back. I feel I have found a home with all of you who so bravely post your thoughts without worrying about reprisal. I enjoyed the podcast! There are some issues of concern however. I think that in 1 Nephi 8 the man in white is more likely an angel of light guiding Lehi through the darkness rather than a dark angel tricking him into it. The interpretation is yours to make, but I disagree. There are sufficient cases of prophets being wrong in addition to the few you mentioned to not need the wide interpretation of 1 Nephi. There is one other scenario of D&C 132 to consider. It is conceivable to me that the basic concept of plural marriage was inspired, but in the heat of the moment with Emma and all the deceit and cajoling that was required to get it started Joseph may have taken liberties with his memory of the revelation previously received possibly years earlier and embellished it in some areas. Then in his execution of the principle there were additional mistakes made that cause some to consider the whole thing wrong. In dealing with this and other complex Church issues I remember that God’s leaders are not perfect and that God, for reasons I don’t understand, apparently gives them great latitude in decision making and may not provide recognizable inspiration to them in some cases. This appears to result in small and large errors and distortions in doctrine, policy and actions by Church leaders and their associates even in the highest councils of the Church. This is frustrating, because it is not what I grew up to understand was the role of revelation and of the prophets and leaders in the restored church of God. Nonetheless, that is apparently the way it is. I will be content with it, though where I can I will make an effort to facilitate positive change. I heartily sustain the leaders with my eyes open. I also remember that just because God’s servants make mistakes, even large ones, doesn’t mean all their actions need be called into question, though it behooves me to obtain spiritual confirmation of anything that feels odd or not right. I feel they have at times made or approved statements that appear at best misinformed or incomplete and at worst deceitful. I take note, but don’t judge harshly and I don’t obsess since I don’t know what their minds and motives were, nor do I have all the facts and haven’t walked in their shoes. I have plenty of loving and serving to do which gets tainted and derailed when I nit-pick and am critical of church leaders. Within reason, I am willing to overlook even significant flaws in and errors by our past and current leaders as I recognize all the other good they’ve accomplished. Though, based on what I understand are historical facts I wonder why God didn’t remove some leaders, I believe God chose them and delegates to them and therefore in the true spirit of delegation He upholds them. I leave judgment to Him. I believe God has asked me to follow leaders, so I will do it. I believe God has also asked me to do what is right, so I will do it. When they conflict I will plead to God for help in making make a choice. So with Joseph and polygamy I choose to believe in the principle, but not in every facet of the revelation or its execution by Joseph or others. I appreciate your response though feel the angel in Nephi does nothing other then lead him to a darkness. But yes one can make it work the other way. I am likely a little more cynical than you. Even though we are instructed to follow leaders, we are also commanded to received our own personal witness of the truth. In a way we have now discarded D&C 132 with the Official Declaration #1. We won’t be going back to Polygamy anytime soon… and as for the eternities we can cross that bridge when we get there. David, you make a excellent point that in a way we have discarded D&C 132 with the addition of OD #1. We do however maintain the theology behind Sec 132 through the ability for men to be sealed to multiple spouses. I believe this is the main reason some people might be hesitant to allow for Bill’s third option. By allowing for the third option it is hard to reconcile our current eternal sealings that involve multiple spouses. Polygamy doesn’t bother me personally, in any case Polyandry should be permitted as well. Why can’t we just leave it up to the individuals involved in each of those plural sealings and God to sort it out? God won’t force anyone to be together or separate for that matter. Having a sealing pronounced is no guarantee, unless the Holy Ghost confirms that sealing. Even then, if some wants afterwards… I just don’t see how you can force eternal relationships unless all parties consent to them. Having an earthly sealing pronounced is for our personal benefit and our piece of mind with regards to the involved parties and their extended families. If there is anything to it that God doesn’t approve of… he will let us know. Presently there is no choice but Monogamy. Bravo Bill for adding some fresh ideas to a muddled and puzzling topic that is D&C 132 !!! I cant remember the last time such ground-breaking thoughts were presented on this subject. WITH your reasoning, the revelation on shaking hands could be false doctrine. when he appeared to him in his room. thats true… i guess that is why we learn by study and by faith and depend on the fruits of the spirit to discern for ourselves. I always thought the “rules” (whatever those are) didn’t apply to the GA type folks because I saw inconsistencies since I was old enough to see such things,..and section 132 has always been on the list. From what I knew, JS didn’t ask Emma about all these women. It never made sense to me why there were 2 sets of rules: one for the high up people, and one for the rest of us. Of course, this is how it has always been in politics and those with wealth and resource in this world, but inside the church it has always been something that I struggled with. The only way I could reconcile this was to add words to the Lord when he said: “For God is no respecter of persons”…. [except if they are GAs]. And yet the best examples of Christlike lives have always been those exemplified by the General Authorities in the LDS church, can you think of other churches exemplifying better Christ like lives? What exactly did Pres Hinkley say @cinderella58? He said 132 in it’s entirety is “not doctrinal”? Bill, I appreciate your thoughtfulness on this. And it’s a very interesting perspective to consider. However, I find it all very confusing and lacking in any kind of conclusion. Yet some very foundational, important, even critical doctrines are taught in 132, other than plural marriage. It seems like a pretty tall order to condemn plural marriage (which the saints practiced at great hardship and sacrifice–and for which we still suffer somewhat today) as something from Satan that misguided generations. As big of a deal as that is, it’s a small item in the eternal scheme of things when compared with some of the other doctrines taught in 132. Do we throw out eternal marriage and other essential doctrines taught or expounded upon in 132 as well? Do we assume the other temple themes and items of priesthood order and authority are all wrong too? Much of what makes Mormonism unique gets discarded if we are to throw out 132 in it’s entirety. Do we also assume that Joseph was repeatedly deceived. It seems the angel may have visited him multiple times and/or received multiple revelations on the matter. Or if instead we question or filter-out only parts of it, what guidelines do we use? It seems like we’re grasping at straws to try and justify, explain, or otherwise set aside the polygamy problem. Just because we’re uncomfortable with it, doesn’t mean it’s not from God. Some theorize that perhaps one major purpose of polygamy was largely an Abrahamic trial for the saints as a whole, and many individually. As such it also serves as a divider as to who will follow, and who won’t (or in our case who will accept it as from God), along with keeping the Saints separate and peculiar so that entrance or remaining in the church isn’t a simple and easy thing. Perhaps much of the discomfort with 132 is intended by God, is a reflection of our own cultural discomfort, and is a manifestation of Joseph’s own discomfort with the matter. He related it in a way that’s imperfect, because of his discomfort. Finding yourself uncomfortable or confused by scripture doesn’t necessarily indicate an evil source. It could merely indicate a misunderstanding of God’s perspective and reasons. He often tells us we can’t fully comprehend why he does all that he does, in the same way we can’t comprehend how he does so much of what he does. I’m not attempting to invalidate what you said, or those feelings. But I find it extremely hard to 1. label plural wives and it’s practice in the church a heresy, 2. believe Joseph was deceived on that entire issue and his deceit was allowed to misguide the church for generations, and 3. especially assume that the rest of 132 is either wrong, or tainted and twisted by a Satanic messenger. many of the D&C sections were a culmination of multiple revelations and it seems 132 is no different. So I ask again: what guidelines do we use? If we’re to assume that your theory is true, then how do we filter out the parts presented by the supposed angel of darkness who visited and misled Joseph on 3 occasions? Do we just use our own modern biases against plural marriage and polygamy and assume that only those parts related to polygamy were taught by this angel of darkness? And what about the experiences of other saints who resisted plural marriage strongly, but had powerful, converting, spiritual experiences to bring them around on plural marriage? Do we just assume they were all deceived as well? Please don’t take this wrong. I’m seeking for truth here. I love your podcast and all that you’re doing. great question… I have no certitude on an answer. It is messy. study and faith, fruits of the spirit, prayer… these all have failed at times too and led down fruitless paths for some. I think the fundamental disconnect for your average Mormon is the way people view revelation. There is this idea that revelation to prophets is something altogether different than the revelation that common people receive. I don’t think history supports this. Scripture contains both human and divine elements and I think D&C 132 contains both as well, but personally I find more disturbing messages than virtuous in that section. I read that James E. Talmage at one point put together a shortened version of the D&C with all of the sections that he felt were worthy of canonization. Unfortunately that project was jettisoned. Might be worth resurrecting, there are other sections with problematic elements that we could discard. Joseph seemed to be comfortable with editing and changing doctrines to reflect his evolving theology, understanding the history of our scriptures would go a long way toward helping people deal with issues like this. 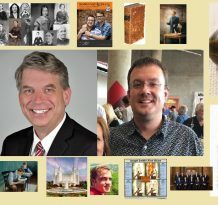 I have listened to Bill Reel’s podcast, “Shaking Hands and Drawn Swords.” The number of historical and doctrinal inaccuracies is truly remarkable. I would encourage him to remove it to save his own credibility. Brian, I welcome a list of inaccuracies that I present within the episode. Brian Hales what is your problem? Are you just trying to tear the church down, because you sir are the NUMBER 1 person right now that has brought me into this new desire to just leave, if the things that you state are true, then I’m out, and I know I’m not the only one that feels this way! Publish your stupid book and dream of multiple wives with Laura, obviously she won’t mind the abuse, you clearly must not have a very close relationship with her! Stop acting like you are the voice of God in the matter of the evil practice of polygamy! I appreciate this podcast and your attempt at trying to find a third way to look at section 132. However I believe you are 180 degrees off. using section 129 as you did let’s look at it in the context of the temple video without being disrespectful. look at the way Satan approached Adam and Eve. No handshakes. Look at the way Peter James and John approached Adam and Eve. there were hand shakes. Using section 129 logic and your logic in an attempt to find a third way you just described it in the temple video. You make Satan a beam of light and a just man who was not resurrected yet and you make Peter James and John evil man attempting to shake hands but appear in white robes. Again what I think you’re trying to do is noble and I agree with you that 132 is not of God. but its not of God because it is morally you’re reprehensible not because Joseph was naively fooled. God is not the author of confusion and would not allow over a hundred years of his people to be persecuted and damaged by this practice. I am sealed to two living women and the brethren have refused to cancel my sealing to my adulterous ex wife. Polygamy to this day subverts free will and .its fruits have not been good. trying to wrap your mind around 132 as anything but disgusting institute mental gymnastics I’m not flexible or willing enough to perform. Bill presented a third point of view as an option to perhaps fit in the doctrine of polygamy to those that have a hard time accepting it. Whether it has merit or not is up to us to consider. I agree that scripture and the process of revelation itself, is messy. Example: Joseph Smith revised his own scriptures. Some of the revisions are very significant. I also agree with ‘hope for things’that revelation to the prophets is not unlike the personal revelation that people throughout the church, and even throughout the world.In 1st Nephi 8, Lehi says, “I have dreamed a dream, or in other words I have seen a vision.” My personal experience with dreams is that they are not synonymous with visions. Many in the Christian world promote the bible to the point that it becomes more important than Jesus Christ himself. I believe many in the Catholic church and the LDS church do the same thing with the idea of authority. Consider that the first commandment is to love God. When people defend a church/doctrine at all costs,even to the point of being deceptive and using “carefully worded denials” it seems possible, even likely that they have set up a false idol. The provenance of D&C 132 is not clear.The origin and practice of polygamy is surrounded by ambiguity and deception. Even if the “father of lies” didn’t originate it, he surely contributed mightily to its practice. The precedent of removing “Lectures on Faith” from the D&C opens the door to the possibility of D&C 132 also being removed. Many people leave the LDS faith on discovering some issues with polygamy. One is the marrying of women already married. Dan Vogel is working on Woodruff’s diaries. One entry he shared on Facebook was one where Woodruff offered his 15 year old daughter Phoebe to BY as a wife. BY said he has enough of those and suggested someone else. She was married to Snow and had nine children to him.